thanks for visiting my world! If you guessed a magic lantern is what Aladdin used, guess again! --when mounted on a trolley, it could make the devil float around the room in mid-air -- to be more precise, make the image of the devil projected onto a gauze screen fly around the audience, often creating panic in the city and nightmares. --the tinker Crel in Singer of Norgondy makes a magic lantern of tin cylinders with animal-shaped holes punctured into the outer cylinder that slid around glass slides on the inner cylinder as his masterpiece. ;) Knowing how to make one gives him an idea that he uses as his weapon in the final battle scene. yep! you guessed it, a magic lantern used to project moving images of light onto walls during the Renaissance was the precursor to the movie projector. You can still see some early 20th century ones used to show (shh) risque striptease slides in some museums around the country. But oh! the use of magic lanterns during "phantasmagoria" shows in the Renaissance can bring such a goldmine of ideas to a fantasy writer! Question for the day: Who led Amazons to the Crusades? --She was a queen of France. --She was then a queen of England. --Her own holding was richer, more powerful, larger, and more cultured than either France or England. --She once escaped abduction and a forced marriage by scaling down a tower wall in the middle of the night. --She led three of her four sons into a war against their father. --She was the mother of Richard the Lion-hearted and Prince John. --At the end of her life, living as an Abottess, she was recognized to be one of the most powerful, wisest people in all of Europe. --She was only partially portrayed in the movie "The Lion in Winter." As a young queen, she led her ladies of the court on horseback and dressed as Amazons to the Crusades, alongside her first husband, the sainted king of France. She was one of the most fascinating women in history, and one of the most fun to read about. Merind's personality in Singer of Norgondy was modeled partly on her story. But the more I researched her, the more incredible her story became. Incredible in the true sense of the word -- harder to believe real than most heroines in movies. read and tell me what you think of Merind. I think she inspired the movie The Lion in Winter, where an aging Katherine Hepburn played her masterfully, in her later years. yes, that's a great movie! But there's so many more stories that haven't been told yet about her, so many more movies and legends she could inspire. History conspires to minimize the exploits of women unconnected to their husbands or children. It's a topic that greatly needs illumination. Make the coffin (piecrust) of a great pie. In the bottom thereof make a hole as big as your fist... Let the sides of the coffin be somewhat higher than ordinary pies. Fill the pie full of flour and bake it. When baked, open the hole in the bottom and take out the flour. Then put a smaller pie the size of the hole in the bottom of the large pie. Around that small pie put as many small live birds as the outer piecrust will hold just before sending the pie to feast table. When the great lid of the pie is cut open, all the birds will fly out to the delight of the company. And then the guests "be not altogether mocked," the small real pie is served. This recipe can be found in Reay Tannahill's Food in History , a great source for fantasy writers. Singer of Norgondy is now available at Amazon! The witchwoman Merind told the young singer Verl that he could create a god and enslave a multitude of believers. But should he? He had the power now to make people believe they were seeing a god. He knew where to touch the god-spot in their minds. But at what cost? How many would die because of him this time? Could he ever play music again? His boyhood friend, Crel, wanted the life of a tinker. Merind’s people needed vengeance against the new queen. Could Crel give up his dreams and become the Bear God avenger her people needed? Should Verl help them create these new false gods? CROSSJACKS! 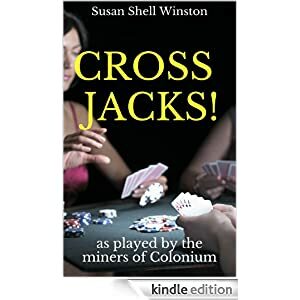 the card game of cutthroat betting and high strategy played by the miners and guardsmen of Colonium is now availabe at Amazon!